The former headquarters of The Times-Picayune and its previously iconic clock tower, have been sold to a group of local real estate investors for $3.5 million, The Advocate and NOLA.com reported this week. The Advocate broke the story Sept. 6, followed by NOLA.com a day later. Local real estate developer Joseph Jaeger Jr.’s 3800 Howard Investors LLC, completed the purchase Sept. 2, The Advocate‘s Richard Thompson reported. Besides Jaeger, the group includes Mardi Gras float builder Barry Kern, president of Mardi Gras World; developer Arnold Kirschman, whose family sold its nearly century-old, New Orleans-area furniture store chain to Florida-based Rooms to Go in 2006; and local businessman Michael White. Both outlets reported that 3800 Howard Investors has no immediate plans for the building, noting that it saw development potential in the improving neighborhoods and for the nearly 9-acre plot. Jaeger’s primary company, The MCC Group, has bought two other high-profile vacant properties in the past year, but they remain empty and dormant: the 45-story Plaza Tower, also on Howard Avenue, on the edge of downtown, and the shuttered Market Street Power plant on the riverfront. The latter is part of a proposal with the Ernest N. Morial Convention Center to develop a hotel, restaurants, entertainment venues and apartments on 20 acres upriver of the convention center, The Advocate reported. No word on what 3800 Howard Investors may do with the custom Art Deco panel by Mexican-born artist Enrique Alferez that adorns the building’s front lobby. NOLA.com reported in late June that the building had been sold, but not to whom. Within days, a crew of workers armed with a crane removed the Times-Picayune lettering that adorned the Clock Tower easily visible from the adjoining Pontchartrain Expressway, and which had become part of the region’s cityscape. Former longtime Times-Picayune Managing Editor/News Dan Shea read about his imminent dismissal in the pages of The New York Times. 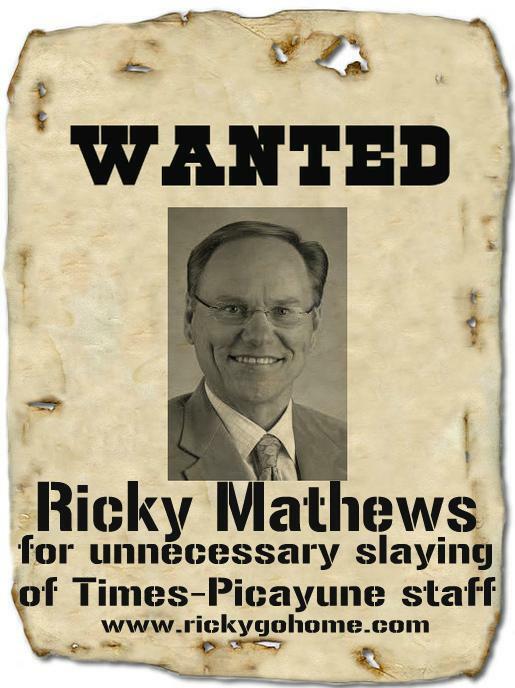 His would be among the most high-profile ousters of wholesale Times-Picayune‘s “digital first” death march in the summer of 2012. L to R: Peter Kovacs, editor of The Advocate, Dan Shea, general manager and chief operating officer, and Publisher and Owner John Georges. Georges announced today that he’s turning over the publishing reins to Shea effective Sept. 1, 2015. What a difference three years makes. It was announced today that Shea will be the new publisher of Louisiana’s largest daily newspaper, which is no longer The Times-Picayune. Shea was among the first hires of New Orleans businessman John Georges, after Georges acquired the Baton Rouge-based Advocate less than a year after The Times-Picayune debacle. Shea and his fellow former co-managing T-P editor, Peter Kovacs, assumed two of the top posts at Georges’ new incarnation of the newspaper: Kovacs was named editor and Shea general manager and chief operating officer, while Georges served as publisher. 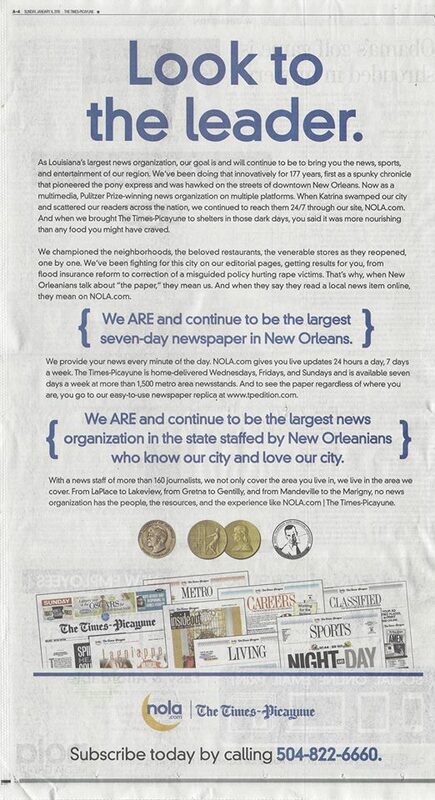 Since the paper’s re-launch under Georges’ ownership, The Advocate expanded and re-branded its Acadiana and New Orleans editions after hiring several dozen former Times-Picayune reporters, editors and photographers, including both those who were laid off during the 2012 purge and others who defected in the aftermath. The saga is detailed in Hell and High Water. More recently, The Advocate expanded its community newspapers from two to nine in Baton Rouge by both creating new publications and acquiring a chain of weekly newspapers. 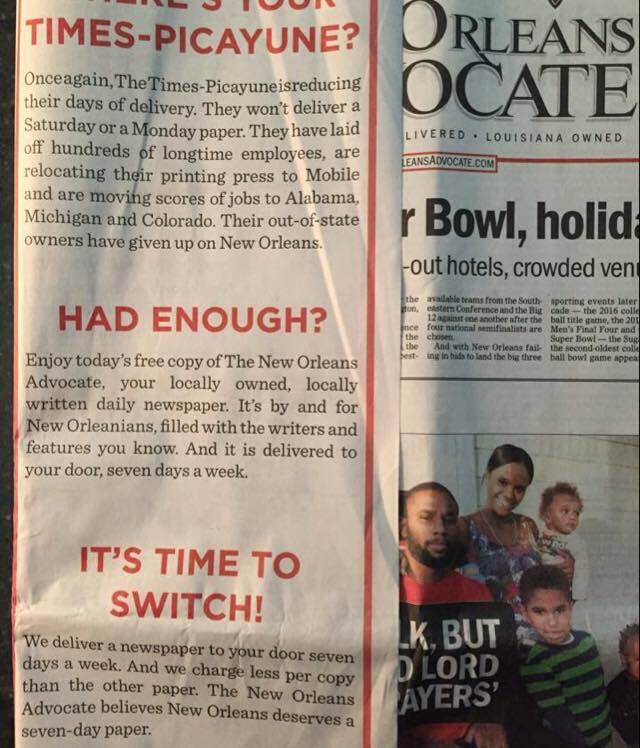 Borrowing from The Times-Picayune‘s community news section strategy that helped that newspaper stave off competition in the region’s suburbs beginning in the 1980s, The Advocate also launched twice-weekly, free community New Orleans editions it says are now distributed to 250,000 homes. The Advocate also operates three websites, and has created apps and e-editions of its New Orleans, Acadiana and Baton Rogue editions. The company is building a $13.2 million new headquarters along Interstate 10 in Baton Rouge, and renovating a historic building along St. Charles Avenue in New Orleans, which will serve as headquarters of The New Orleans Advocate. According to reports both newspapers filed as of March 31, 2015, with industry group the alliance for Audited Media, The Times-Picayune‘s Sunday print circulation fell 18.5% during the first quarter of 2015 compared to the same quarter in 2014, from 127,902 to 104,213, while The Advocate’s grew slightly, from 105,464 to 107,965. The Times-Picayune filed a second quarter 2015 report showing print circulation at 104, 213, but as of today, AAM’s website has no corresponding report posted for The Advocate. When “digital non-replica” editions are included – which encompasses e-editions and apps – The Times-Picayune‘s Sunday circulation was 121,126 during the first quarter of 2015, while The Advocate reported 133,599. Newspaper website metrics are represented in a wide variety of ways and tallied by a number of independent organizations, and are not always included in AAM reports. Newspaper circulars are the backbone of what’s left of the newspaper advertising business, so the news in Sunday’s Advocate is big: two of the largest grocery store chains in New Orleans, Rouses and Winn-Dixie, are shifting the bulk of their advertising to The New Orleans Advocate. Over the next month, they will leave their advertising home of many decades, The Times-Picayune. As Bruce Nolan, my former boss, “people’s reporter” and major character in the book noted when sharing this news on Facebook, this may sound like inside baseball to those who don’t know the newspaper business, but “this is a hard punch in the mouth” for NOLA.com/The Times-Picayune. “The rockslide triggered in 2012 rolls on,” (which the book documents), Nolan added.